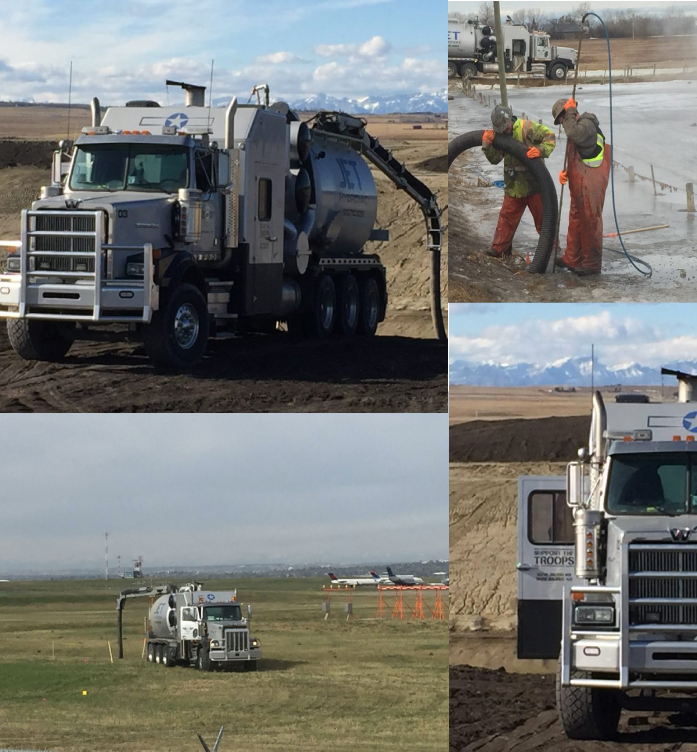 Jet Hydrovac is a Calgary based, family owned and operated company that consistently provides their customers with prompt and cost effective solutions to their hydrovac needs. We achieve consistency by hiring experienced professional employees that are dedicated and truly care about providing our customers with the best service in the industry! Match those employees up with new equipment boasting the latest technology in hydro-excavating and you have a winning combination. Non destructive hydro-excavation or “Hydrovacing” is a vital part of any underground construction, road building/City infrastructure projects where there are conflicting utilities within the proposed dig area. Striking a live utility by mistake with an excavator poses a serious safety hazard to onsite employees as well as the public and can cost thousands of dollars in fines and repairs. We can safely and efficiently locate any buried utilities you may encounter on your job sites such as water lines, sewer lines, storm lines, gas lines, power lines, fibre optic,Telus and Shaw Communications lines without causing any damage to the utility at all. Not all excavation equipment can reach every spot. If your excavation project is in a hard-to-reach or remote area, count on Jet Hydrovac to perform the remote excavation Calgary uses most when regular equipment is out of the question. Power cables and transformers are notoriously dangerous to excavate. That’s why at Jet Hydrovac, we make sure our hydrovac services are conducted safely – our operators are fully trained in the safe power cable and transformer excavation Calgary expects. JET HYDROVAC is an approved hydrovac contractor for The City of Calgary along with Enmax, Fortis, Telus, Shaw Cable and Atco gas approved. We are also a COR certified company focused on providing a safe work environment for our employees, our clients and the communities we work in. If you are looking for a hydrovac company that will arrive on time, complete the required job efficiently, invoice the customer fairly and have a positive attitude throughout, give us a call! We do it all! Feel free to contact us at anytime for your Hydrovac solutions. We offer services twenty-four hours a day, seven days a week. Emergency appointments available. *We offer services 24 hours a day; 7 days a week Emergency appointments available.